E. W. Nay was a colourist. He thought through colour and translated his concepts through the use of colour. 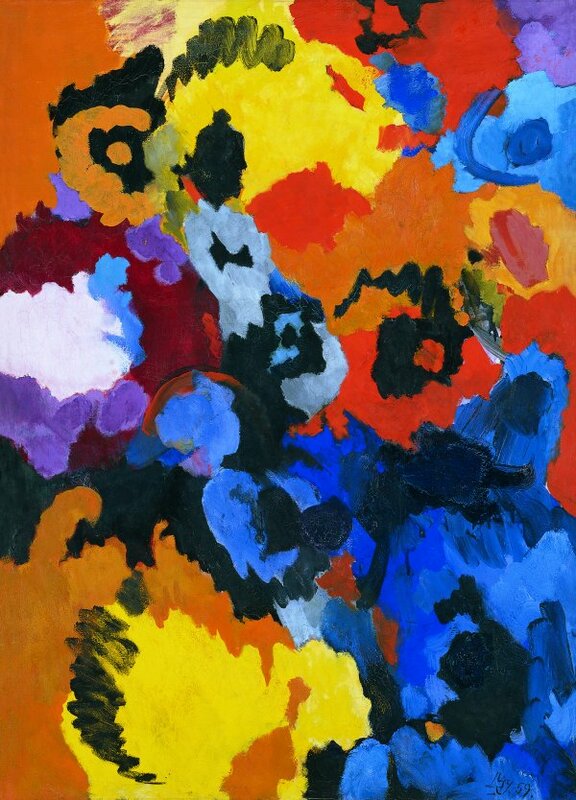 After the Second World War he used colour to move beyond figurative painting. "Colour, as an artistic value which needs to be conceived with the spirit, is so immeasurable, so unpredictable", the artist summed up six months before his death, "that any painter who conceives starting unequivocally from colour is forced to re-classify colour from his own point of view in a new system, and to express himself on the basis of that system". Nay hoped to obtain an objective validation with his chromatic system, as this not only should not be a closed system, but should also attempt to be in line with the intellectual trends of his time. He himself related his concept of an anti-illusionist, colourist painting to Jean Gebser's outline of an non-perspective image of the world, which requires a new level of conscience, evocable through the medium of painting. The second important point of reference for Nay was the surface, because colour can only be laid on a surface: "Thus, colour becomes a configurative value and, at the same time, also the configurative colour becomes the configurative value of the surface". Colour and surface, the two cornerstones of Nay's optical theory, constitute the basis of the so-called "system of disks". It was based on punctual disks, that is, of colour, with which Nay attempted to develop a "syntactic technique" of colour, independent from Nature and Natural Sciences. For this, first he placed on the surface of the painting various sets of disks of the same colour. Then, he filled chromatically the space between them, that is, the negative shape of the subject. In this way, he created a pictorial space in which he integrated rhythm, without the three-dimensional quality of depth. Nay spoke of "flat space". This is a characteristic of the set of works entitled Scheibenbilder (Paintings with disks) (1954-1963), in which the disk and the variations of it constitute the leitmotiv. In spite of the systematisation of the structure of the painting, the juxtaposition of the colours does not follow any particular logic. Nay tried to dispose the shades in a deliberately "a-causal" manner. His chromatic scale, therefore, was not the expression of emotional states. Even in his reduction to a maximum of 14 colours, he offered an infinite variety of combinations. Nay's paintings were created in the moment in which they were painted, often without interruption. For that reason, there are no preparatory studies or sketches. On the other hand, the artist worked by producing series. In the large "Plateau-Serien" he elaborated subjects, while in the empirical series he developed individual complexes in greater depth. In contrast with the Scheibenbilder, in which the structure is relatively solid, in this painting the order is decomposed in irregular coloured shapes. The circular disk loses its contour, it becomes a stain or surface. The polychrome pictorial shapes merge without shadows or modelling. They cross and complement each other. There is no background against which they can stand out. Everything, even the shading, wants to be a configured surface. With its quick brushstroke, Nay spread on this vertical composition his palette of colours characteristic of the end of the 1950s. The artist, who preferred cold colours, accentuated the bottom right-hand corner with a set of various shades of blue and black, which find their counterpoint in the bright white. The two formal motifs painted in bright lemon yellow in the top and bottom edges of the painting accentuate further the composition. The chromatic disposition of the colours on both sides of the dark area emphasise this effect. The bottom left-hand corner and the top half of the painting are dominated by the colours yellow, orange and ochre. The tension created by warm and cold colours, and light and dark shades, gives dynamism to the chromatic composition. The "absolute form" and the "pure vital force" are gathered in this painting. According to the artist, that is how the true meaning of his art is achieved.